When a tooth develops an infection below the enamel in its sensitive nerve tissue (called the dental pulp), this can cause the mother of all toothaches. In the past, teeth with this kind of damage would simply be removed, but using a root canal, the team at New Haven Dental Group can save even the most damaged teeth and help them look and function like new again. 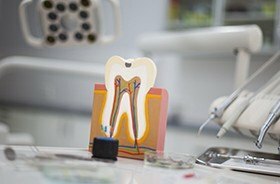 Thanks to our modern techniques and technology, this long-feared procedure is now one of the most effective ways we can relieve— not cause—severe dental pain. Dental sensitivity to hot or cold temperatures that lingers for more than 20 seconds. Severe pain in a particular tooth. Pain when biting down on a tooth. 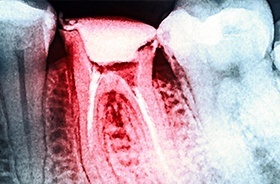 Redness or swelling in the gum tissue. A small bump on the gum line near a tooth. If you’re in need of a root canal, our team will simply numb your tooth, remove all of the infected tissue, and then rebuild it with a restoration. Most patients say the procedure feels like getting a small filling, and afterward, you won’t experience any more dental pain!